When you're the minority computing platform, you have to try harder to get along. As OS X has evolved, it's gotten better and better at working alongside Windows PCs, taking part in Windows networks to share files and printers. The original OS X didn't do this, but the first major revision, 10.1, added SMB (a.k.a. Samba or CIFS), an open source clone of Microsoft's Windows networking that is widely used in Linux and other non-Microsoft operating systems. But making it work wasn't easy. 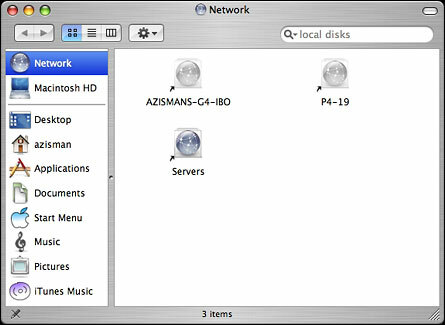 Users could connect to Windows networks, but they had to know the IP address or network name of the server and had to enter it manually in the Finder's Go:Connect to Server menu. Printing to a shared Windows printer in 10.1 presumably was possible, but it took more skills at the Terminal command line than I was capable of. OS X 10.2 (Jaguar) made both of these easier. The Go:Connect to Server dialogue let users browse to Windows servers on the network, just as it did with Mac servers. 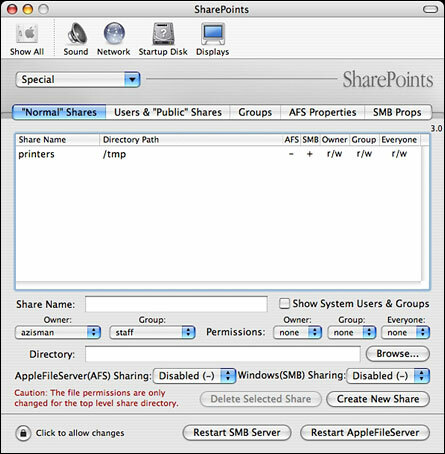 It was also possible to connect to shared Windows printers using Jaguar's Print Center utility, but it still wasn't easy. You needed to use a "secret" - holding down the Option key while clicking the Add button in order to get the option to connect to a Windows printer at all. And you needed to manually enter the computer's network name and the printer's share name. And, finally, you needed a networkable printer driver; the Mac versions of the drivers for most Windows printers wouldn't let you print across a network. 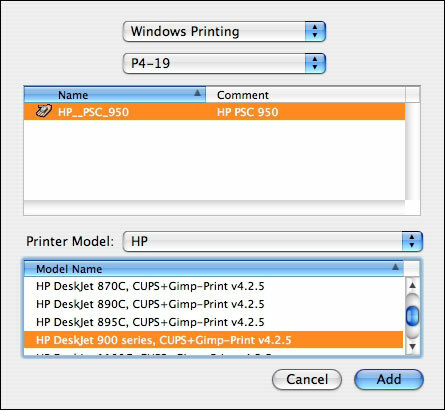 The open-source Gimp-print provided network-friendly drivers for literally hundreds of printer models, but putting it all together was a process that sometimes worked and sometimes didn't. The button near the top right gives a dropdown list of recently used servers. Clicking on the Browse button takes you to a Finder window, open to Panther's big networking usability improvement. Panther's Finder includes a sidebar, with icons to frequently used folders and discs. 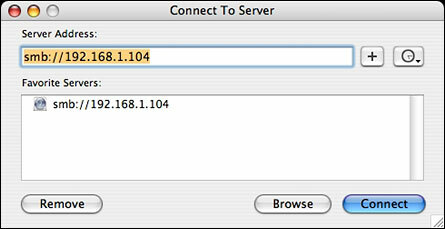 As well, a Network item can be used to show aliases to accessible servers, whether they're Mac, Windows, or Unix servers. Double-clicking one may require a log-in name and password, but then will show available folders. Integrating the network into the Finder makes it easier to treat shared folders and their contents like files and folders on local drives - and makes it easier to work with them in applications. The standard Panther open and save dialogue boxes also makes it easier to open networked files and to save to drives and folders across the network. And Panther users don't need to know whether the server they're accessing is another Mac or a Unix or Windows box. In fact, they'll hardly know they're accessing the network at all! Panther makes printing to shared Windows printers much easier as well. Jaguar's Print Center utility is gone (and not missed, as far as I'm concerned!). Instead, there's a new Print & Fax system preference. Just as the new Finder integrates network access with accessing local drives, this item treats networked printers as normal members of the system - no more secret commands. While this is much easier than in Jaguar, you're not out of the woods yet. You still have to select a printer model. And you'll still bump up against the same gotcha as before - few Mac printer drivers allow for printing across a network, whether the printer is connected to a Windows machine, another Mac, or connected directly to a network printer server. Take my HP PSC950 all-in-one. 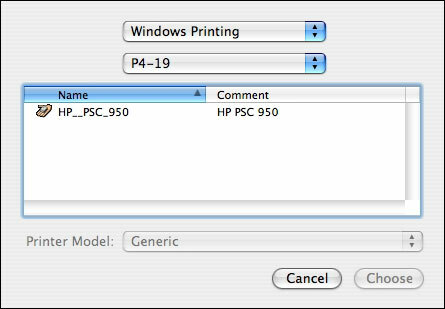 HP's drivers work fine when the printer is connected directly to my Mac, but they are useless when the same printer is accessed across the network. (This is one area where Windows does better: Windows doesn't care - if you have the right printer driver installed, it can print to that model printer no matter how it's connected. And in many cases, even if you don't have a driver installed, if you connect to a printer across a Windows network, the system will get the drivers from the remote computer). (Afterwards, you may need to fiddle with the print options; the first time I went to print to my networked printer, I found the defaults were set for low-resolution line art. After resetting them, though I had quite acceptable text and graphics output. Reasonably speedy, too). 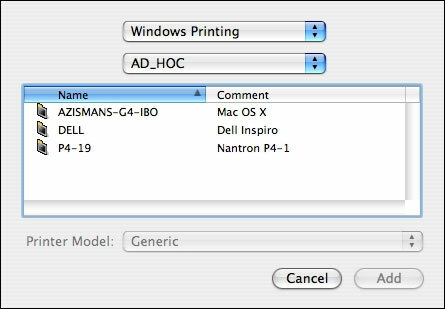 That same Print & Fax system preference includes a one-click option to share printers across the network. (I haven't tried it, and can't comment on how well Panther shares its printers with Windows systems). While it's not particularly easy to use, it does offer the power to customize the Mac OS's options to share folders and files across both Mac and Windows networks. Panther is a big step forward to letting Mac and Windows work seamlessly together.